According to BIS Research analysis, the global earth observation satellite, data and service market generated $7.17 billion in 2018 and is estimated to grow at a CAGR of 9.10% during 2018-2023. Earth observation (EO) satellites find applications in agriculture, weather prediction, environment monitoring, and mining industries, among others. The U.S., Canada, France, the U.K., Japan and India are some of the major countries who have developed earth observation (EO) satellites for different applications. With the data and images from EO satellites catering to the ever increasing applications, several commercial players have come up with disruptive technologies such as integration of geospatial data with precision positioning further giving rise to opportunities in new segments such as precision agriculture, financial service, and retail industry, among others. These trends, along with the conventional ones are expected to consequently drive the market in coming years. In terms of revenue, the global earth observation satellite, data and service market generated a revenue of $7.17 billion in the year 2018. According to BIS Research analysis, the global earth observation satellite, data and service market generated $7.17 billion in 2018 and is estimated to grow at a CAGR of 9.10% during 2018-2023. North America dominated the global earth observation satellite, data and service market in 2018, whereas, Asia-Pacific is expected to have the highest growth rate during the forecast period 2018-2023. • The report identifies the global earth observation satellite, data and service market under different segments such as end user, subsystem, technology, application, and region. • It examines the prime demand-side factors that affect the growth of the market and the current and future trends, market drivers, restraints, and challenges prevalent in the global earth observation satellite, data and service market. • The report also highlights the value chain and emerging business models of the industry. • This report includes a detailed market share analysis, which analyzes the share of the players in the global earth observation satellite, data and service market of the prominent companies. • The market for different end users such as government and defense, forestry and fishery, energy and natural resources, archeology and civil infrastructure, agriculture, and others, has been estimated and analyzed. • The report studies the market analysis depending on the application of earth observation data and service data acquisition and mapping, sustainable development and environment management, disaster management, security and surveillance, and location-based service in 2018, and the expected estimates by 2023. • The global earth observation satellite, data and service market has been analyzed in the report for the major regions including North America, Europe, Asia-Pacific, and Rest-of-the-World. 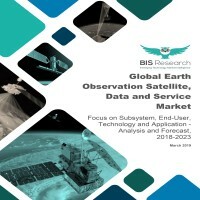 • The study provides detailed analysis of 15 key players in the global earth observation satellite, data and service market, including Airbus SAS, Ball Corporation, DigitalGlobe, Harris Corporation, Lockheed Martin Corporation, OHB System, Thales Group, The Boeing Company, BAE Systems, BlackSky Global LLC, Planet Labs Inc., Satellogic, Skylab Analytics, Spire, Surrey Satellite Technology Ltd., UrtheCast, Orbital Insight, ImageSat International, ICEYE, Spire Global, Capella Space, Descartes Labs, and RS Metrics, among others, in the company profiles section. This section covers business financials, company snapshots, key products and services, major developments, future programs (if any), and the individual SWOT analyses. The earth observation satellites have evolved as the most important source of data for monitoring and understanding the climatic environment and terrestrial changes. In today’s scenario, more than 150 remote sensing satellites are orbiting the earth and supporting the weather forecast and subsequent studies. Earth observation satellites have been providing satellite data to the government agencies and other such critical institutions, wherein the data provided was guarded closely. However, commercial operators and service providers are now gradually recognizing the huge potential in data and images provided by earth observation satellites. This has led to new business models wherein government agencies and commercial operators work together on operation missions of national importance such as weather prediction, border surveillance, natural resources survey, and so on. With new market opportunities and satellites like GeoEye, WorldView, IKONOS, and Quickbird constellations having the capacity to capture very high-resolution images of 0.5m, private companies have been emerging as worldwide champions. In the recent times, start-ups companies have been acquiring investments, with an aim of combining information technology with earth observation. This disruptive market trend has turned space into a profitable commodity and these players are known as “New Space”. Together, the government agencies, commercial operators and new space actors with big and new ambitions in space are now using earth observation satellites as an instrument of soft power and sovereignty. Some of the key players in the global earth observation satellite, data and service market includes Airbus SAS, Ball Corporation, DigitalGlobe, Harris Corporation, Lockheed Martin Corporation, OHB System, Thales Group, The Boeing Company, BAE Systems, BlackSky Global LLC, Planet Labs Inc., Satellogic, Skylab Analytics, Spire, Surrey Satellite Technology Ltd., UrtheCast, Orbital Insight, ImageSat International, ICEYE, Spire Global, Capella Space, Descartes Labs, and RS Metrics. These companies are aiming for a wide range of product launches and collaborations to expand their operations and also to prevent new companies from becoming future competitors. At the same time, a number of startup companies are venturing into the market to provide earth observation satellite, data and service to varied end users. The preceding figure illustrates the revenue generation of the global earth observation satellite, data and service market in 2018 and in the forecast period, 2018-2023. The market reported a revenue of $7.17 billion in 2018 and is expected to grow at a significant CAGR during the forecast period 2018-2023. The global earth observation data and service market has been segmented into different end-users: government and defense, forestry and fishery, energy and natural resources, archeology and civil infrastructure, agriculture, and others. The government and military end-user segment acquired the largest share in 2018; and is anticipated to remain dominant during the forecast period, 2018-2023. In addition, the global earth observation data and service market is also classified depending upon the application i.e. data acquisition and mapping, sustainable development and environment management, disaster management, security and surveillance, and location-based service. The sustainable development and environment management segment had the highest market penetration in 2018. However, the location-based service segment is estimated to grow at the highest CAGR during the forecast period, 2018-2023. North America accounted for the highest share of the market in 2018, owing to the maximum number of earth observation satellites, data and services developed. However, Asia-Pacific is expected to witness the highest growth during the forecast period, 2018-2023, mainly due to the continued efforts in the development of satellite technologies to transform the national economy and strengthen nation-security.